The kidney cells that make EPO are specialized so that they are sensitive to low oxygen levels in the blood coming into the kidney. These cells make and release EPO when the oxygen level is too low. Chemically, what is erythropoietin (EPO)? EPO is a protein with an attached sugar (a glycoprotein). It is one of a number of similar glycoproteins that serve as stimulants for the growth of specific types of blood cells in the bone marrow. What exactly does erythropoietin (EPO) do? Erythropoietin stimulates the bone marrow to produce more red blood cells. The resultant rise in red cells increases the oxygen-carrying capacity of the blood. Initiate the synthesis of hemoglobin, the molecule within red cells that transports oxygen. Is the kidney the sole source of EPO? No. EPO is produced to a lesser extent by the liver. The EPO gene has been found on human chromosome 7 (in band 7q21). Different DNA sequences flanking the EPO gene act to control liver versus kidney production of EPO. Why is an EPO test done? Too little EPO might be responsible for too few red blood cells (such as in evaluating anemia). Too much EPO might be causing too many red blood cells (polycythemia). Too much EPO might be evidence for a kidney tumor. Too much EPO in an athlete suggests EPO abuse. How is the EPO test done? The patient is usually asked to fast for 8-10 hours (overnight) and sometimes to lie quietly and relax for 20 or 30 minutes before the test. The test requires a routine sample of blood. What are normal EPO levels? Normal levels of EPO are 0 to 19 (some say up to 24) mU/ml (milliunits per milliliter). What does an abnormal EPO level mean? Lower than normal values of EPO are seen, for example, in anemia due to chronic kidney failure. Elevated EPO levels can be seen, for example, in polycythemia rubra vera, a disorder characterized by an excess of red blood cells. The correct interpretation of an abnormal EPO level depends on the particular situation. Can a normal person have a high EPO level? Yes. For example, EPO has been misused as a performance- enhancing drug in athletes such as cyclists (in the Tour de France), long-distance runners, speed skaters, and Nordic (cross-country) skiers. When misused in such situations, EPO is thought to be especially dangerous (perhaps because dehydration due to vigorous exercise can further increase the thickness (viscosity) of the blood, raising the risk for heart attacks and strokes. EPO has been banned by the Tour, the Olympics, and other sports organizations. 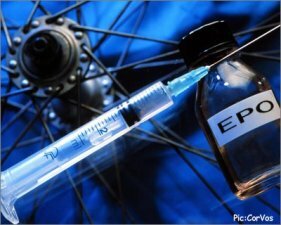 Is EPO available by prescription? Yes. Using recombinant DNA technology, EPO has been synthetically produced for use as a treatment for persons with certain types of anemia - for example, anemia due to kidney failure, anemia secondary to AZT treatment of AIDS , and anemia associated with cancer. Therefore, EPO can be used to correct anemia by stimulating bone marrow red blood cell production in these conditions. Erythropoietin (EPO) is a kidney hormone. EPO promotes the formation of red blood cells by the bone marrow. The EPO hormone can be detected and measured in the blood (the EPO test). Measurement of the blood EPO level can be used to detect certain conditions. EPO can be synthesized and used as a treatment of some forms of anemia. Erythropoietin (pronounced /ɨˌrɪθoʊˈpɔɪɨtɨn/, /ɨˌrɪθroʊˈpɔɪtən/, or /ɨˌriːθroʊ-/) or EPO is a glycoprotein hormone that is a cytokine for erythrocyte (red blood cell) precursors in the bone marrow. Also called hematopoietin or hemopoietin, it is produced by the liver and kidney, and is the hormone that regulates red blood cell production. It also has other known biological functions. For example, erythropoietin plays an important role in the brain’s response to neuronal injury. EPO is also involved in the wound healing process. As a class of drug EPO is an Erythropoietin Stimulating Agent (ESA). They may be synthesized and administered exogenously. However, such molecules can at a latter stage be detected, since they differ slightly from the endogenous ones in e.g. features of posttranslational modification. Will epo help mesothelioma …?? ?